It’s always a delight to celebrate with CTANZ members when their projects come to fruition, so congratulations to Elly van de Wijdeven on the publication of Vintage Paua Shell Jewellery (Bateman, RRP $50-ish from good bookshops). For those of us who grew up during paua’s unfashionable years, it’s enlightening to see a wider range of pieces, elegantly showcased and given historical context. Elly and her publishers have done a lovely job of this handsome book. If you’re in Auckland between now and the end of October, you can see some of the featured jewellery at Objectspace. Elly has also set up a new website: objectgallery.co.nz, through which you can order the book directly for $46 including standard postage. This entry was posted in Books, Jewellery and tagged jewellery, kiwiana, paua. Bookmark the permalink. wonderful news indeed. 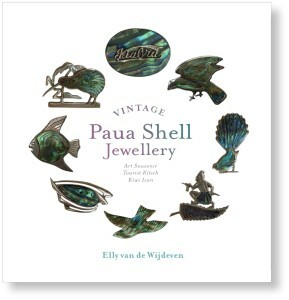 the book has reminded me to hold onto my little gems of paua broaches collected over the years.